There seems to be an idea out there that any serious 21st Century composer must be making music that is “cutting edge” or “experimental” or some other “far out” description. But why should that be the case? Consider the culinary arts. Yes, there are very talented people out there creating “cutting edge” and “experimental” foods. 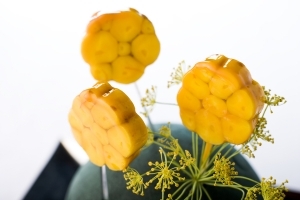 Google “molecular gastronomy” and you’ll see an example of Adam Melonas’s “Octopop” (which is “a very low temperature cooked octopus fused using transglutaminase, dipped into an orange and saffron carrageenan gel and suspended on dill flower stalks.”) I have no idea how such a thing would taste, but I would presume that it wouldn’t sell repeatedly if customers didn’t like it. But while there are these bold pioneers into new food frontiers, there are also world-renowned 21st Century chefs who focus all their attention on more traditional things: grilling (or baking or steaming or frying) the perfect hamburger, baking the perfect chocolate cake, building and baking the perfect ratatouille. All of these foods have been around for quite a while, but such chefs are not considered any less artists for focusing on perfecting something that is already around and well known. So why should it be different for composers? Why shouldn’t composers likewise be respected and honored, even in the 21st Century, for trying to compose a beautiful waltz, an engaging ragtime, a baroque fugue—or any of the countless other musical forms? In both musical and culinary terms, I personally lean toward the traditional. That said, I certainly won’t turn down something just because I have not tried it. On the contrary, I love discovering and experiencing both music and food from different countries and cultures around the world. While an “Octopop” sounds interesting, it’s not the kind of food that I’m going to seek out ahead of good comfort food. And it is the same with me as a composer. I want to create music that does for the ears and the emotions what good food does for for our other senses. I want to create something familiar enough that listeners feel that they know it. Yeah, I might throw in some surprising textures or flavors, but my goal is always going to be a satisfactory musical meal. So if you want to taste the musical equivalent of a nitrogen foam elk pate bleu with emu feather reduction, I’m probably not the composer for you. I’m just not that “molecular gastronomy” type of person. However, if you want a great musical Eggs Benedict, or a mouthwatering Reuben, or even just a good solid peanut butter and jelly sandwich, then hey, I’m your guy.